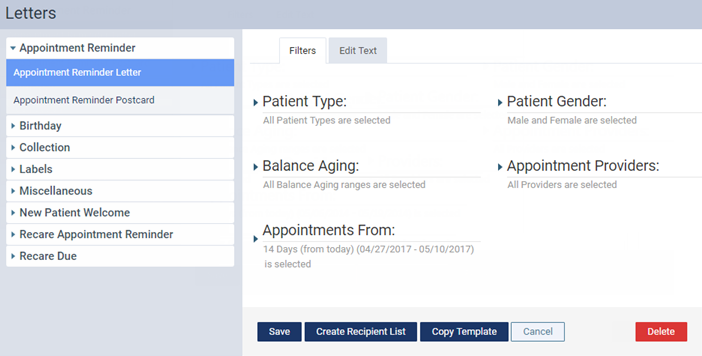 To make the creation of a letter template fast and easy, you can create a copy of a letter template that you can then merge with patient and practice information according to specified criteria (filters). On the Home menu, under Location, click (or tap) Letters. On the Letters page, select the type of letter template that is similar to the letter template that you want to create. You can choose from the following types of letter templates (which are contained in sections that you can expand and collapse): Appointment Reminder, Birthday, Labels, New Patient Welcome, Recare Due, and Recare Reminder. Click (or tap) Copy Template. The Copy Template dialog box appears. Type a name for the letter template. You cannot change the category. You can now customize the filters and content of the new letter template as needed.